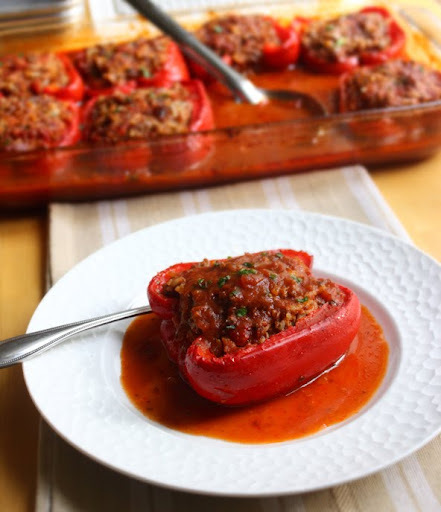 I reworked the stuffed pepper recipe for the cookbook, and this was the result. I've posted the written recipe below the photo, and I highly encourage you to try it out. Enjoy! Add the olive oil to a saucepan, and lightly brown the onions with a large pinch of salt over medium-high heat. Remove half and reserve for the stuffing. Stir in the rest of the sauce ingredients and bring to a simmer. Pour the sauce into the bottom of a large deep casserole dish. Add all the filling ingredients to a mixing bowl, along with the reserved onions, and stir with a fork, or your hands, until the mixture is combined. Tip: you can cook a small piece of the filling to test the seasoning. Cut the bell peppers in half lengthwise. Use a spoon to remove the stem, seeds and white membrane from each pepper. Place the bell peppers in the casserole dish, and fill each pepper with the stuffing. A little additional cheese can be grated over the top if desired. Cover with foil and bake for 45 minutes. Remove foil and bake uncovered for another 20-30 minutes, or until the peppers are very tender. Exact cooking time will depend on size, shape and thickness of the peppers. Best to let rest for 10 minutes before serving. Serve with the sauce spooned over the top. Quick tip if I may.... The recipe for Lebanese stuffed peppers/tomatoes includes pine nuts. They give a great flavor and add crunch and texture contrast to the soft meat stuffing. My eyes are on that stuffed squash below the post. Waiting impatiently for your summer. Double sigh! That is absolutely beautiful-looking. I'll have to try it sometime. I don't really like bell peppers, but that looks tasty enough to give them another try! You ever try using uncooked rice? It seems to me like it would be easier to work with than cooked rice. raw is actually much harder to work with since you need lots of liquid, and to keep the peppers submerged. Okay. Then is the rice measured before or after it's cooked? just like reads, "2 cups cooked rice." fyi, Recipes will always say cooked rice if that's the intention. We use rice that has soaked in hot tap water for about 20 min. Its not cooked nor raw either, but works in our stuffed cabbage recipe. Its not a liquid hog this way. A little bacon would be good in this too, I think. I'm not partial to the green peppers. Too bitter tasting, but the red peppers are sweeter. Can't wait to try this for a change. They are in the oven right now! But i had way too much filling, do you think I can save it in the freezer? Yes you can! Or make meatball and cook in pasta sauce! Fantastic recipe! Would it be possible to prepare it ahead of time, freeze it for a few days and then cook it? Or should I freeze them already cooked? These are in the oven now! Using ground turkey but they sure smell good! I hope I didn't mess them up by using turkey.